Can't decide what oil is your favorite... this is the set for you. 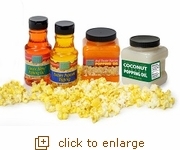 Try a sampling of all our premium popping oils and determine your favorite. Real Theater Coconut Popping Oil: This is one of the secrets to making movie theater style popcorn. Comes in a 1 pound jar that makes approximately 17 batches of popcorn in the Whirley Pop. Organic Coconut Oil: A NEW and healthy choice, this oil is gluten free, cholesterol free, no preservatives, non-GMO, as well as vegan. Pure and delicious!